Weekly Winner – Viva La France Comfort Food! Wow, it’s been awhile. I know I’ve slacked off at this for a bit but to make it up, hopefully I will get two posts in this week. This first one was actually prepared two weeks ago but due to my work and travel schedule, has not been posted yet. I adore all things French. I would like to say it is in my genetic make-up but alas, I do not believe I have a drop of French blood in me. German, sure. I touch of Irish, absolutely… but French? Non. For whatever reason, perhaps a former life, I love French food. Not necessarily the fussy high-end cuisine found in US French restaurants (although I see nothing wrong with that either) but French country fare. Everyday French food found in bistros and prepared using simple ingredients in a soul-satisfying way. This dish fits the bill perfectly. 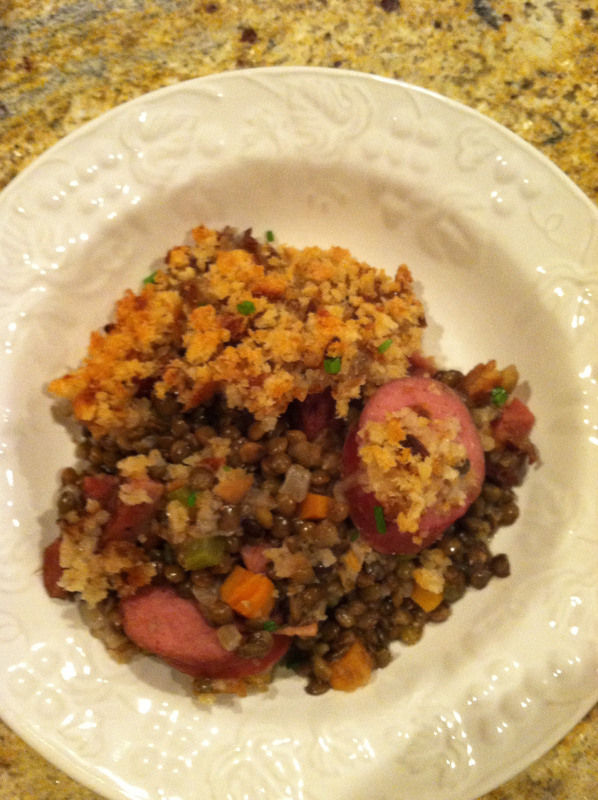 Lentil and Garlic Sausage Cassoulet. I found the recipe in Bon Appetit and while it is a bit time-consuming, there is nothing difficult with this recipe. The results are sheer cozy goodness. Make it all. Regardless of how few people you are serving because the leftovers are just as tasty. Weekly Winner – or in this case, Weekly Dinner! This has been a very busy, hectic week. Hubby was traveling all week and I had crazy long work hours. I really didn’t cook anything during the week but relied on all of my past efforts that were safely tucked away in the freezer for just such a week. Finally, Friday came along and I had time to cook. Hubby was flying home and would arrive around dinnertime. I asked him what sounded good. His response: “Meat and potatoes”. So here it, the only thing I made this week. Luckily, it was amazingly good and worthy of a Weekly Winner post even if it had faced any competition! The recipe came from Food Network Magazine. Please do not skimp on the garlic sauce or decide it doesn’t need it. It is incredible and actually quite mild considering the amount of garlic. 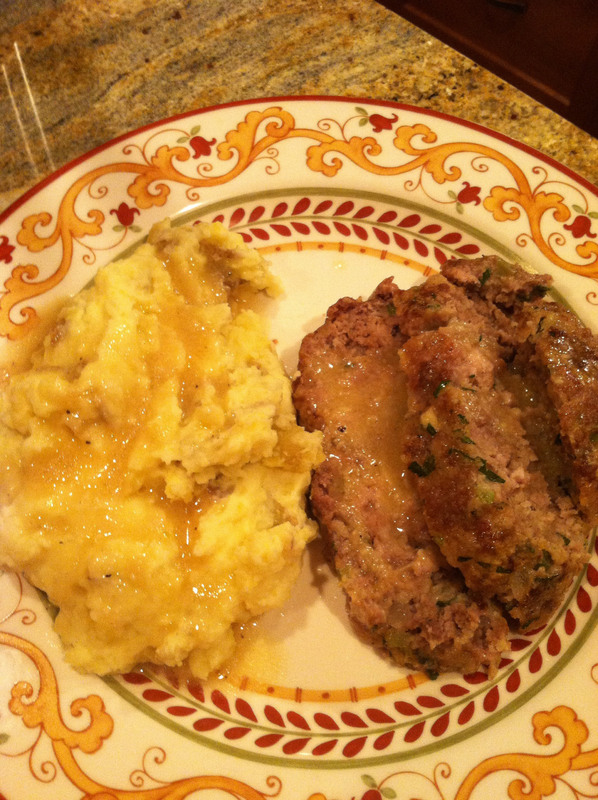 Even though I halved the recipe for the meatloaf I made all of the sauce. It made an amazing gravy for the mashed potatoes. Heat the olive oil in a large (12-inch) saute pan over medium heat. Add the onion and celery and cook for 5 to 7 minutes, stirring occasionally, until the onion is translucent but not browned. Set aside to cool slightly. Place the beef, veal, pork, parsley, thyme, chives, eggs, milk, salt and pepper in a large mixing bowl. Put the panko in a food processor fitted with the steel blade and process until the panko is finely ground. Add the onion mixture and the panko to the meat mixture. With clean hands, gently toss the mixture together, making sure it’s combined but not compacted. Combine the oil and garlic in a small saucepan and bring to a boil. Lower the heat and simmer for 10 to 15 minutes, until lightly browned. Be careful not to burn the garlic or it will be bitter. Remove the garlic from the oil and set aside. I adore soups. I particularly adore creamy soups. Nothing makes me happier than when the weather gets a bit chilly and I know its time to start rifling through all my wonderful soup recipes. I also love spinach. And while I have plenty of soups that include some spinach, and I have loads of “cream of (something)” soups, I noticed I didn’t have a spinach soup recipe where spinach was the main attraction. Until now. And a creamy spinach soup? Now you’re talking! This was a luscious, flavorful, soul satisfying soup that could definitely be considered healthy and was relatively low in calories. Bonus! I believe I got this recipe from a recent issue of Cuisine at Home Magazine but I’m not entirely sure. I am sure that it is a definite Weekly Winner. 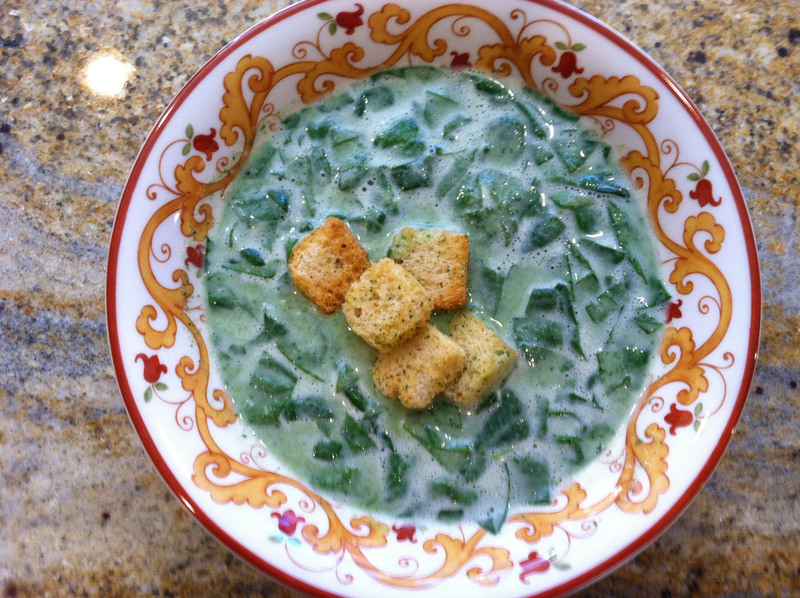 Here it is: Creamy Spinach Soup. Sauté onion in oil in a large pot over medium-high heat until softened, 3-5 minutes. Add garlic and cook until fragrant, 1 minute. Stir in flour and cook 2-3 minutes. Whisk half-and-half and broth into flour mixture. Bring soup to a simmer over medium-high heat. Add 8 cups (5 oz) spinach and cook until tender, 5 minutes. Reduce heat to low. Puree soup with a handheld blender until smooth. Stir in remaining 4 cups (2.5 oz) spinach (chopped) zest, lemon juice, and nutmeg; season with salt and pepper. Serve soup with croutons.